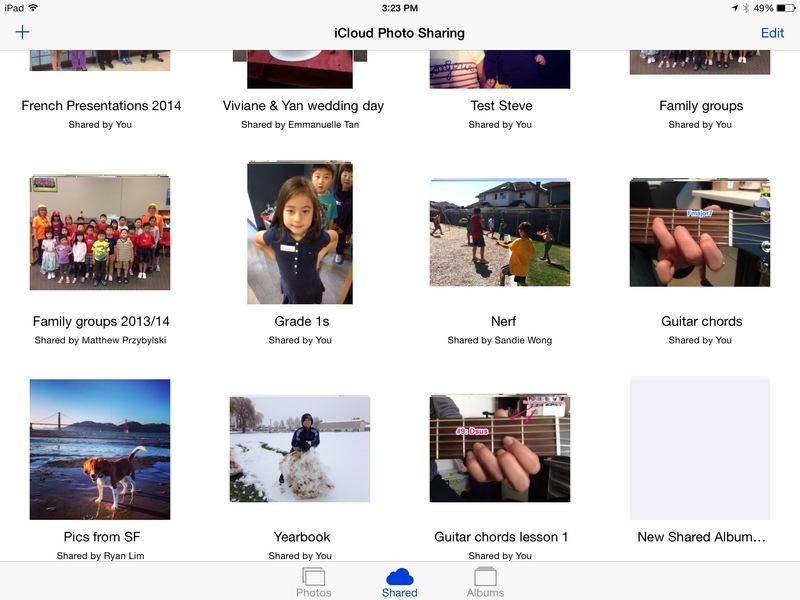 Where did My Camera Roll and Photo Stream go in iOS8? A lot of people must have complained, because Camera Roll and My PhotoStream have resurrected. Download the latest software update, iOS 8.1, and everything will be like it was. 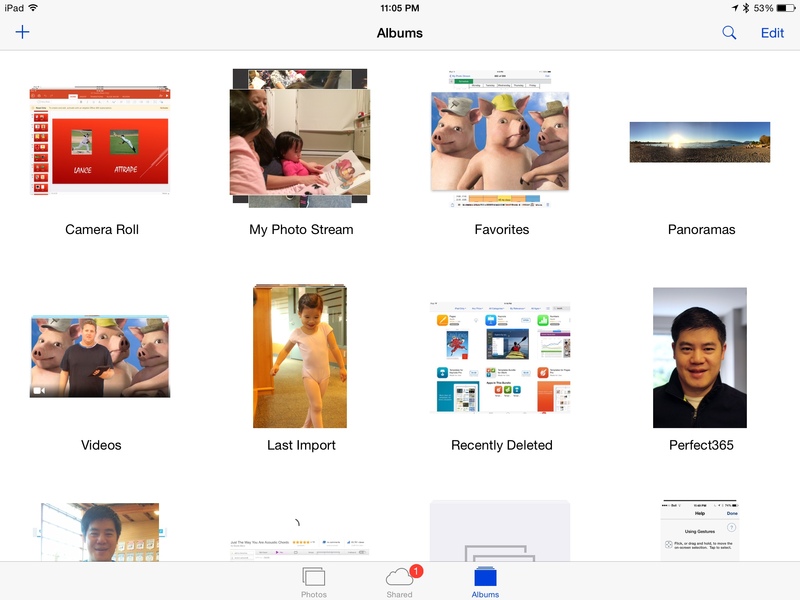 People who downloaded iOS8 this week were surprised to find something very familiar missing from their Photos app. Gone is the Camera Roll that we have been so accustomed to. Also gone is the Photo Stream folder that contained the last 1000 photos taken on all our devices. These have been replaced by a Recently Added folder. Looks pretty messy, in my opinion. I enjoyed having the distinction between the two. Photo Stream was, for me at least, just a safeguard of my iOS photos in case I deleted any of them off my Camera Roll by accident. However, since I have automatic uploads on Dropbox set for photos and videos, I really only used Photo Stream to access photos across my devices. I will still be able to do that with the new system. With all the new changes, it is now confusing as to how much the Recently Added folder takes up storage on each device, since it seems to be a combination of both photos taken on that device and Photo Stream photos. People with small capacity devices would often just delete photos and videos to save space. Now, we don’t know what takes up space and what doesn’t. Also new to iOS8 is the Favorites album. Here you can add photos from any other album for fast access. To do this, tap the new “heart” when viewing that photo. As far as I can see, Favorites are local to the device, and not synced between them. Recently Deleted is another new folder in the Photos app. This serves as a “Recycle Bin” for all the photos that you delete. They have a shelf-life of 30 days. You can choose to save storage space by permanently removing them again, or, if you accidentally deleted them, you can restore. This is another welcome feature that will prevent any precious photos being deleted. If you seem to have lost all your Photo Stream photos from before updating, simply go to Settings – iCloud – Photos and turn My Photo Stream “off” and then turn it back on right away. Your photos will slowly return back into the “Recently added” folder. You will get this warning: But don’t worry, your photos are stored in iCloud already (that’s the point). However, the order of the photos doesn’t seem to be correct. Hopefully this will not be the case as you add photos over time. 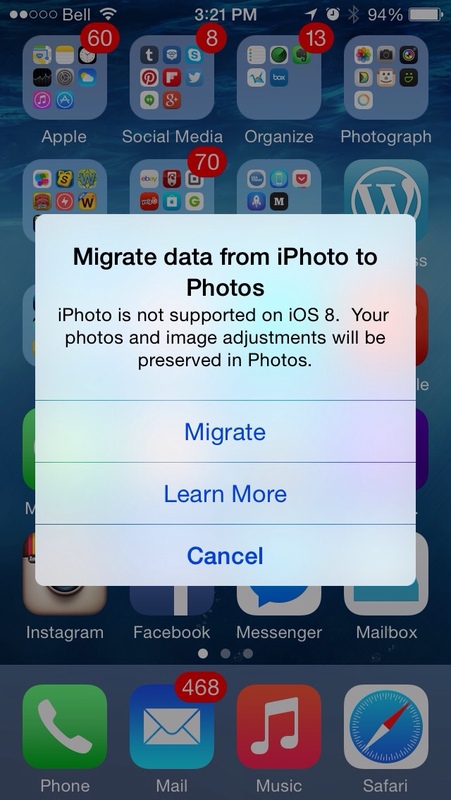 Looks like iPhoto (the app) will no longer work on iOS8. Too bad. I was liking the editing features there. I sadly deleted iPhoto off my phone and iPad. In yet another subtle change, the “Photos” tab will organize your photos into “collections”, based on the dates. Your latest photos will appear at the bottom, then yesterday’s photos, then beyond that, they are grouped by location and time. However, this is NOT just what is locally stored on your iPad. I noticed that some iPhone photos were there. So, as far as I can see, you still don’t really know where the original source file is for your photos. Store photos into a shared photo album. These will remain in there forever, and you will have access to them all the time on all your devices under the “Shared” tab. I still have albums from when this feature was first announced over two years ago. You don’t even need to share the photos with anyone. Simply add an album (tap the + sign), and leave the “To:” field blank. Add as many photos there as you like. Obviously, you can add anyone of your friends to the album, where they can also add photos to it. Please give this a try and let me know if it works. Shared Photos, however, do take up space locally on each device. 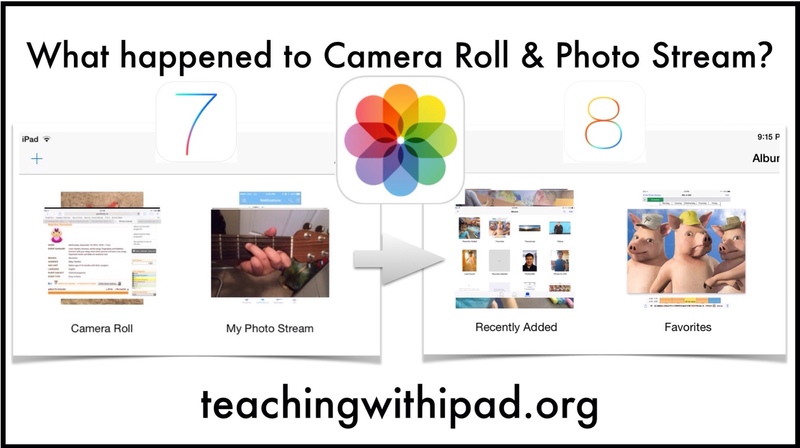 Moving ahead, we now need to slowly start using terms such as Camera Roll and Photo Stream in our descriptions in future blogposts and workshops. It will be a bit confusing at first, since some will not have updated to iOS 8. Adding photos to posts using Blogsy is a little more tedious now. It recognizes the “Recently Added” folder, but it’s not in any order. Third party apps will hopefully figure some way to organize the most recent photos and images, to create less headaches . Read an iMore.com article on the same topic. Thoughts? Complaints? Let us know in the comments! Next Post Print Wirelessly from Your iPad/iPhone Today! Win an xPrintServer! well that didn’t work and I just lost all my Photo Stream photos too! Do you have a second device that hasn’t been updated to iOS 8? They will still be there. Guaranteed. It makes me feel like I’m not alone in my utter confusion due to the removal of photostream and camera roll. The key line in your article: “the order of the photos doesn’t seem to be correct”. Apple, please either bring back the photostream or at least give the “recently added” folder some kind of logic to its organization! Not only am i missing photos and have tried every suggestion to find them, i am also having an issue with not being able to set the cover photo on my albums (which could be done in the past). Very UNHAPPY,,, Please help me find my pictures. Workaround – every time you take photos (a nuisance, I know!) plug your mobile device into your iMac or Mac laptop, and use Image Capture. It will grab all of your photos, in order, and download them. At least you get them in order, in one place. Thanks for the suggestion. You can’t just do it occasionally? Will the order be out? Do you know how to free up storage for photos & camera? I have the iphone 5 (ios 8.1) and it says that I have 5.3 GB used under “Photo Library” yet I only have 132 photos and 12 videos. Each video is only 1-2 minutes long. I don’t get it! I always transfer my photos every month to my laptop so I should have a lot of storage. Any ideas? It says I have 0 bytes available right now. Thanks! Best bet is to save all videos ans photos, do an icloud backup and then do a full restore. Erase all contents and restart. Great, I will do that. Thanks for getting back to me! I need help! I have “photo stream” enabled but I still don’t have a photo stream folder on my ipad. No photos from my iphone sync to it. Hellp!!! Is your iPad updated to 8.1? But look! Isn’t the OS so elegant, bringing order to complexity? Who needs to, you know, actually be able to find things? The OS gets out of your way and doesn’t distract you with unnecessary detail like knowing whether your picture is on your phone or in the cloud, or with how much free space you have. That’s clutter! See how white and pretty it is? I have, on my PC in icloud, a my photostream, but not on my ipad. I put some photos into this folder on my PC. Where can I find them on my ipad? How can I upload photos to icloud so they appear on both ipad and PC? Did you upload the photos on iCloud.com or did you just place the photos in a folder? It might not work if it was the latter. I don’t have a “Recently Added” Folder. I have an “All Photos” folder but that is all. I am so frustrated with this change. Any suggestions? I’ve disabled and enabled My Photo Stream, uninstalled and re-installed iCloud on my PC desktop and no change.